With chocolate box looks, this idyllic Devon cottage has been extended over the years to create a wonderful home and has been in the same ownership for approximately 43 years. The original cottage is built of cob and still retains its charm and snug feeling whilst the rest of the house offers bright and airy accommodation with generous sized rooms and lovely vistas from most of the windows. The accommodation currently comprises of a welcoming thatched storm porch opening into a hallway. The cottage kitchen complete with feature Aga runs at the back of the house with views over the garden and swimming pool. There is plenty of cupboard space, and bespoke granite worktops and space for a table and chairs. The dining room opens into the rear porch and the lounge enjoys a wood burning stove, deep sills and window seats and exposed ceiling beams. There is also a WC, utility room and integral double garage which could be converted to create further living accommodation or annex potential, STP. The first floor opens out off a spacious landing with two double bedrooms, a further single bedroom (currently used as an office) and a guest bedroom which forms part of the original cottage with exposed A` frames and characterful deep sill windows. There is also a family bathroom with roll top bath and separate shower and WC. The master suite is accessed through a landing door and comprises of an ensuite bathroom, sauna room and a wonderful master bedroom with windows to triple aspect enjoying views over the gardens and surrounding countryside. As expected, the wrap around cottage gardens are a real delight and enjoys a primarily level nature. A five bar gate opens to a sweeping drive leading to a parking area for numerous vehicles and access to the double garage. The main area of lawned garden is to the front and side with mature planting, specimen trees and surrounded by hedge row. The rear garden comprises of a level patio with timber Pergola, ideal for alfresco dining, lawned areas, mature and well tendered flowering beds and cottage flowers, several timber sheds, summer house and open front entertaining mews and of course, the wonderful heated open swimming pool with changing room, cover and entry steps along with a further timber Pergola. The swimming pool is surrounded by paving, planted rockeries and seasonal planting. There is also a handy composting area and gated access to the adjoining field. The side garden is laid to level lawn with a couple of specimen trees. All told, a simply wonderful outdoor area for the family, budding gardener or someone looking for the potential to create a slice of the good life. Even though the cottage enjoys a rural setting and is situated in an enviable position on the outskirts of Newton Abbot, it is also within easy sticking distance of the town and the nearby Seale-Hayne Estate with its artisan shops and facilities. 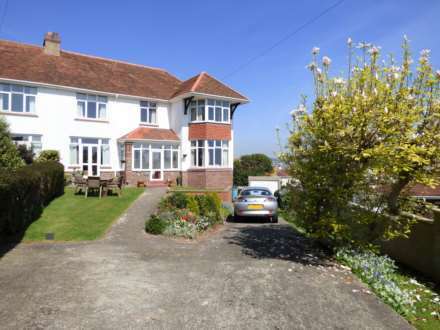 With excellent commuter links to Exeter, Plymouth and Torquay and a mainline train station, there are a wide range of local amenities, shops and both primary and secondary schooling. For the outdoor lovers, Dartmoor National Park and the beautiful coastline of South Devon are within easy striking distance as is to the estuary towns of Teignmouth and Shaldon offering a plentiful selection of water sport activities and lovely beaches. Coved and textured ceiling, stairs rising to the first floor, radiator and telephone point. Obscure glazed window to the front, low level flush WC, wash hand basin, radiator and tiled floor. A stunning cottage kitchen with recessed spotlights, two glazed windows to the rear aspect overlooking the garden and swimming pool. Comprehensive range of matching base and eye level units with granite work tops with matching up stands. Under slung sink unit with grooved drainer and mixer tap above. Oil Aga range and inset two ring bottled gas hob and inset deep fat fryer. Integral dishwasher and fridge. Open plate rack, radiator, quarry tiled style flooring and multi pane glazed door to rear lobby. Coved and textured ceiling. Two glazed windows to the side aspect, glazed window to the front aspect and glazed door opening into the rear porch.Two radiators. A beautiful room dating back to the original cottage with exposed ceiling beams, two glazed windows to the side aspect with deep sills, further glazed window to the other side aspect along with obscure glazed door to the side. Fireplace incorporating a wood burning stove with slate hearth and bressimer above. TV aerial point and three radiators. Two metal up and over doors, courtesy door to the rear, glazed window to the rear aspect. Work bench, power, lighting and radiator. The main bedroom is above the garage and the utility to one side so this area could be used to create a single or two floor annex, subject to the necessary permissions. A thatched porch with triple aspect glazed windows and timber and glass door to the garden. Hatch to loft space, glazed window to the front aspect enjoying views over the garden and surrounding countryside. Radiator. Multi pane glazed door to inner hall. Door to sauna room with sauna unit and tiled shower cubicle. Door to bedroom and door to ensuite. Built above the double garage, this room offers a light and airy feel with part vaulted ceiling with painted ceiling timbers. Triple aspect glazed windows to the front, side and rear, all enjoying views over the gardens and surrounding countryside. Range of built in wardrobes. Two radiators. Sloped ceiling with limited head height. Borrowed light from the bedroom. Low level flush WC, pedestal wash hand basin with shaver point above, panel bath with Victorian style telephone mixer taps with shower attachment. Extractor fan, tiled walls and floor and ladder style heated towel rail. Built in the original cottage this a beautiful room with bags of charm. Sloped roof with exposed A` frames and ceiling beams. Low level glazed window to the side aspect with deep window seat and further glazed window to the front aspect, both enjoying a pleasant outlook over the gardens and countryside beyond. Radiator and dressing area. Glazed corner windows to the rear and side aspect over looking the surrounding countryside. Range of built in bedroom furniture and vanity sink unit with shaver light point above. Radiator. Glazed window to the rear aspect overlooking the garden and swimming pool area. Radiator. Glazed window to the side and front aspect. Radiator. This room is currently used as an office. Textured ceiling with recessed spotlights, obscure glazed window to the rear. Roll top bath with Victorian style telephone mixer taps with shower attachment. Separate tiled shower cubicle with mixer shower and pedestal wash hand basin. Built in airing cupboard housing the immersion hot water tank. Tiled walls and floor and chrome effect heated towel rail. Obscure glazed window to the front, low level flush WC, radiator and tiled wall and floor. As expected, the wrap around cottage gardens are a real delight and enjoys a primarily level nature. A five bar gate opens to a sweeping drive leading to a parking area for numerous vehicles and access to the double garage. The main area of lawned garden is to the front and side with mature planting, specimen trees, surrounded by hedge row. This also benefits from a selection of fruit trees and raised vegetable beds and greenhouse. The rear garden comprises of a level patio with timber Pergola, ideal for alfresco dining, lawned areas, mature and well tendered flowering beds and cottage planting, several timber sheds, summer house and open front entertaining mews and of course, the wonderful heated swimming pool with changing room, cover and entry steps along with a further timber Pergola. The swimming pool is surrounded by paving, planted rockeries and seasonal planting. There is also a handy composting area and gated access to the adjoining field. The side garden is laid to level lawn with a couple of specimen trees. All told, a simply wonderful park like outdoor area extending to approximately 0.66 acres, an ideal haven for the family, budding gardener or someone looking for the potential to create a slice of the good life.